Last weekend was my first weekend at FOSDEM! I’m really glad I finally made it there! Apart from a little Friendica developers‘ meeting, I learned how to add a new setting to Friendica, I heard interesting talks and I met old acquaintances as well as new cool people. If you have an Ubuntu computer, the installation routine is great! Compared to all the steps I had to accomplish when I first flashed an Android phone, this is so smooth. Once it’s installed, there is a little wizard that guides you through the most important settings and teaches you how to slide (three directions). Then next, you wonder how to get to the „desktop“ / how to see the empty background. Well, no. You always look at an app. You can choose a background image but you’ll only see it before unlocking the screen. There is an Ubuntu app store. While on the Ubuntu desktop you can access the software repositories without authentication, the phone wants you to sign in with Ubuntu One. (Which is not exactly a plus, in my opinion.) I admit that I didn’t try to use the command line way before signing in. That remains to be seen. openssh-server is already the newest version. 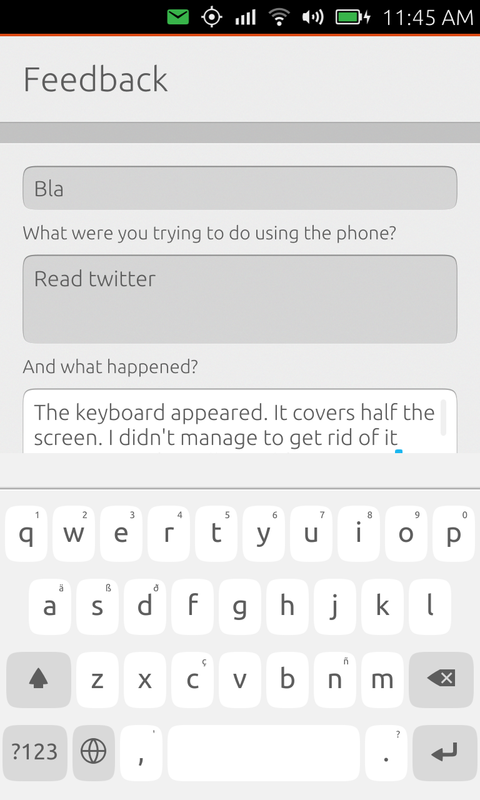 The keyboard’s behaviour (see screenshot): It’s either expanded though you don’t want to edit anything or it hides parts of the input filed you’re typing in. The lock screen displays the boring fact that „1 text messages sent today“. The prominence of commercial platforms. I understand that this gets Canonical some funding and it’s possible to uninstall things like the amazon app. But still, development seems more driven by closed / commercial services than by free and open ones. 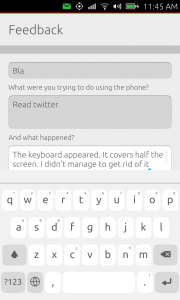 A Jabber app with OTR encryption. Comfortable things like an OSM editor, an ownCloud client, a firewall (no doubt this is feasible as I am root on the device). Wifi with WPA2 Enterprise encryption. It’s a very cool toy and I want to learn more about it. It’s not for my daily use (yet). Though the developer at FOSDEM said it’s his „production“ phone. What is interesting for me: Looking at this device, I see things that happened to Ubuntu Desktop in a different light. I had been wondering about web apps, all the display server discussion, the Unity desktop (which I don’t use). Some of this makes more sense if they manage to „streamline“ desktop and phone or tablet.